Rereading classic SF in the 21st century: In which I both tease out themes of, and try to summarize, Isaac Asimov’s first Foundation book. I put ‘trilogy’ in quotes because while the ‘Foundation Trilogy’ was an omnibus of three previously published books, most of the contents of those books were published years earlier as a series of novelettes and novellas, in Astounding Science Fiction magazine, throughout the 1940s. When gathered together for book publication in their early 1950s by Gnome Press, they were divided up into three volumes, titled Foundation, Foundation and Empire, and Second Foundation. Each was a linked collection of from two to five stories; none of them was exactly a novel. 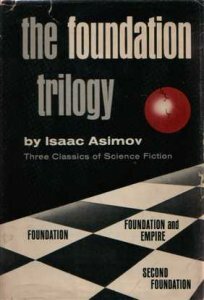 The three books were gathered together in a single volume called The Foundation Trilogy: Three Classics of Science Fiction in 1963 by Doubleday, a volume that went on to become a featured selection of the Science Fiction Book Club (which was an arm of Doubleday). And that volume was in fact one of the three introductory selections that I chose when I first joined the club in 1969. Later I also bought the ubiquitous paperback editions from Avon, with their distinctive geometrical illustrations on white backgrounds. These books are still the most famous works by Asimov, and represent a stage in what Donald Wollheim, in his book The Universe Makers, considered the default future history of mankind — (discussed here: http://www.markrkelly.com/Blog/2015/09/18/rereading-donald-a-wollheims-the-universe-makers/) — as conceived by science fiction of the time, which is to say, a far future era in which humanity has expanded into outer space and has settled *millions* of planets, inhabiting virtually the entire galaxy as a single human empire. Asimov’s interest in these stories was the idea of how human history might be foretold; he drew heavily on the ideas of Edward Gibbon’s famous The History of the Decline and Fall of the Roman Empire (https://en.wikipedia.org/wiki/The_History_of_the_Decline_and_Fall_of_the_Roman_Empire), about how such a mighty empire could begin to decay at the edges and gradually bring itself down. Asimov’s premise was that advanced mathematics, and theories of history, could *predict* such a decay — and moreover, suggest ways that small, surgically-precise steps in local politics, might ameliorate that decay, in order to rebuild a second, stronger empire. I think in my previous readings of this book, I lost interest at the end because the last story of this first book is curiously undramatic. Nothing happens at the end, other than the main character deciding not to intervene, and just let things happen. Why he does that, and what he thinks will happen, are significant, but they don’t leave you with any suspense about what might happen next. 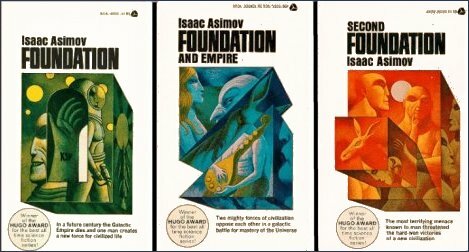 Here are some general notes on the series as a whole, and some very condensed summaries of the five stories in the first book, Foundation, first published in 1951. The book consists of five sections, four of them originally published as novelettes in Astounding in 1942 and 1944, with the initial section new to the book as published in 1951. Each section consists of a series of scenes consisting almost entirely of dialogue. The book is like a play of five acts, each act broken into scenes. Though some of the early stories were written not long after the earliest Robot stories, there’s little of the egregious characterization and exaggerated saidisms that we saw in those stories, and in “Nightfall.” (As noted in this earliest post about Asimov’s short fiction: http://www.markrkelly.com/Blog/2015/08/28/rereading-isaac-asimov-part-1/ ) Perhaps the stories were revised for the 1951 book publication? We know at least one was. Asimov precedes many sections of the stories with long quotations from the “Encyclopedia Galactica” as a way of filling in background material, somewhat as Star Trek did with its captain’s logs, though in a more general way. Page references here are to the SFBC edition of the trilogy. The earliest stories are set about the year 12,067 in the Galactic Era; (there’s also a reference, page 4b, to 12,000 years of Imperial progress). At the same time, there’s a reference to mankind having atomic power for 50,000 years (! ), p50.0, suggesting that it took 20th century Earth millennia (38,000 years!?) to expand into a galactic empire. Everyone seems to speak a common language. There’s no overt religion… just the phony religion set up by the Foundation to control technology. There are no aliens, and no robots. People don’t live any longer than they do now; cf. comment p30.4 about how no one alive now will be living a century from now. Everyone (well, the men, since there are barely any women in this book) smokes cigars. The Empire consists of 25 million inhabited planets. Ships jump instantaneously through hyper-space. This story was new to the 1951 book, and for me has always been the most memorable story in the book. It follows one Gaal Dornick, a mathematician from the planet Synnax, as he arrives on a spaceship at Trantor, the center of the Galactic Empire, to interview for a job with Hari Seldon, who has developed a theory of ‘psychohistory’ that predicts the collapse of the empire within several centuries. Trantor is an extrapolation, obviously, of Manhattan (though when the earliest stories were written, Asimov’s hadn’t yet moved to New York, but was living in Philadelphia) – a crowded city of skyscrapers that, on Trantor, had expanded to cover the entire planet. It’s a single city of 40 billion people. The city is so all-engulfing that many people never see the sky; when Dornick ascends a Tower to see the sky, he’s told how some people get hysterical here. Psychohistory is defined on page 14; its key points are that it deals only with large groups, and with groups unaware of the analysis – not with individuals. Seldon, in a memorable scene, challenges Dornick to use the principles of psychohistory on the spot, to calculate a certain result – without offering him a ‘calculator pad.’ That is, here’s Asimov anticipating hand-held calculators, in 1951. Seldon explains that his plan is to reduce the interregnum between the fall of this empire and the rise of the next, by saving all human knowledge, in an Encyclopedia Galactica (which, as we’ve already seen through quotes, apparently was eventually written). The original 1942 version of this story, the first ever Foundation story published, in Astounding in May 1942, was called “Foundation,” and opened with a page and a half introduction as Hari Seldon conducts a last meeting of a group he’s worked with for 20 years to plan two “Scientific Refuges” at Terminus and Star’s End – at opposite ends of the galaxy, he says – to help build a Second Galactic Empire after this one falls. This section ends with Hari saying, “I am finished!” This original version of the story was reprinted in The Great SF Stories 4 (1942), edited by Asimov and Martin H. Greenberg (DAW, 1980). This story is set 50 years after the first, and is set on Terminus, where the encyclopedists, running the show, anticipate release of the first volume in 5 years. The gist of this story is that Terminus, where Hari Seldon’s 100,000 academics have settled, is being run by academics who are naive about the local politics of their planet with respect to other nearby planets. On one of those planets, Anacreon, the Royal Governor has declared himself king. Since Terminus is mineral-poor and depends on trade, Salvor Hardin, the mayor of Terminus, tries to raise alarm. An envoy from Anacreon visits, and inadvertently reveals that his planet has lost the ability to use nuclear power, and has reverted to using oil and coal. The envoy strongly implies Terminus needs Anacreon’s protection, for the price of establishing a military base on Terminus. An imperial envoy, Lord Dorwin – who lisps and takes snuff (Asimov’s characterizations are not subtle) – discusses the “Origin question” about which planet humanity actually originated from. He does his ‘research’ by reading the books of older archaeologists, and thinks this is the ‘scientific method’. The political tension is resolved as Salvor Hardin and his aide stage a coup, taking control of Terminus away from the academicians and to politicians. The dramatic tension resolves as a pre-recorded 3D message from Hari Seldon appears in a ‘Vault,’ to announce that the idea of writing an Encylopedia was a fraud – his real plan was to shorten the barbarism between empires, and that the solution to the current crisis – which he had foreseen 50 years before – is “obvious”! The empire is crumbling as massive bureaucracy precludes new development and research – this seems to be the key thesis in Asimov’s projection of a collapsing empire, illustrated here as planets lose atomic power; the ‘scientific method’ is a matter of reading books. Terminus is at the political mercy of its neighbors, with no imperial support. Hardin cites a maxim: “violence is the last refuge of the incompetent.” This is repeated several times. Hardin diagnoses the current situation as one of deferring to authority or to the past, like the encyclopedia itself, instead of pursuing new research or training new technicians. Hardin thinks a bigger issue is: why was only one psychologist included at Terminus? Was Hari Seldon trying to hide something from them? The solution to the crisis of the previous story is given in passing: mayor Salvor Hardin pressured the other three of the nearby ‘Four Kingdoms’ to force Anacreon to withdraw its threatened takeover of Terminus, lest the other three fall next. Then Terminus began providing scientific aid to all Four Kingdoms – but in the context of a priesthood, of a religion about the Galactic Spirit and so on, with priests being taught only empirical knowledge of how to run the atomic generators, not the real science behind them, p86t. The conflict of this story begins with a challenge to Hardin by a cabal of young politicians, led by Sef Sermak, to take action against the Four Kingdoms. Meanwhile, a derelict imperial battle cruiser has been found by Anacreon, and the leader there, the regent Wienes watching over the young King Lepold, demands that Terminus repair it for him. On Anacreon, Wienes itches for war with Terminus – but Lepold hesitates, fearing it might be blasphemy to challenge the head of the church. On Terminus, Hardin seems unconcerned. One of Sermak’s aides returns from Anacreon to report that the religion there works. And how the Foundation fostered this delusion; the monarch (King Lepold) rides around on a floating chair surrounded by a radioactive aura, to underscore his divinity. Hardin, in fact, makes a trip to Anacreon to celebrate the coming of age of King Lepold. During the celebration, regent Wienes confronts Hardin with news that military action has begun against Terminus. Hardin responds by calmly waiting for midnight – when a prearranged strike by the entire priesthood takes place, and the power goes off, and king’s aura fades, and his floating chair falls to the floor. Mobs outside riot for Hardin’s release. Meanwhile, the imperial cruiser – repaired by Terminus but now in use by Anacreon against it – is cursed by the priest on board, and turns back to Anacreon. Hardin tells Wiemis a fable about a horse and a wolf – the bridle and saddle – about how, once accepted, the yoke of science cannot be shrugged off. Wienis, enraged, tries to kill Hardin – who’s surrounded by his own aura. Wienis kills himself. And he reminds them of the other Foundation, at Star’s End. Terminus placates its hostile neighbors by offering them technology—but in the guise of a religion; technology which they use but do not understand. On these planets the technology enables the rulers to seem semi-divine, with glowing auras, etc. But the smart politicians know the religion is a ruse to control the masses. Hari Seldon foresees the reign of religion giving way to regionalism, or nationalism. The focus of this story is about interstellar traders, who work outside politics and forge connections among planets in advance of the politicians. The theme, boiled down, is that the Foundation is trying to lure independent planets back under Foundation control by tempting them to buy atomic devices. We begin as one such trader, Limmar Ponyets, receives instructions from his Guild to proceed to the planet Askone, a closed planet whose nationalistic tendencies reject [Foundation-derived] atomic gadgets of any sort, but where a visiting trader, Eskel Gorov, has been imprisoned. Moreover, Gorov is a Foundation agent, with the specific mission of persuading key government officials to purchase atomic gadgets, and thus extend the Foundation’s controlled commercial empire, p142b. Ponyets comes to Askone and deals with its Grand Master, who objects to ‘devil’s machines’ and claims atomic goods are worthless because they lack ‘ancestral blessing.’ But Ponyets perceives that the GM is wheedling for a bribe, and so whips together a slapdash transmuter, and demonstrates in the GM’s court that it can turn iron to gold, and arranges to sell the device to the GM in exchange for the release of Gorov, with a bit of blackmail to assure the deal is never revealed. Another Salvor Hardin epigram: Never let your sense of morals prevent you from doing what is right! Again, the politician Grand Master is educated, and realizes religious customs are ritualistic… 150.4. Note that the transmuter isn’t a trick; it works, but will only work for a short time, which Ponyets uses in his blackmail of the GM. It’s the wedge. This story begins back on Terminus, some 70 years since the last “Seldon crisis” – i.e. story #3. The issue here is the possible re-appearance of atomic weapons – outside the Foundation’s control – on one of the independent planets, suggesting that planet may have re-contacted the Empire. There’s also the suspicion by Terminus that the traders are getting out of hand, perhaps engaging in treachery. The trigger for both ideas is the reported disappearance of three trade ships in the Korellian Republic and the possible appearance of atomic weapons there. Could this be another “Seldon crisis”? Master trader Hober Mallow is sent to Korell to see what’s going on. The planet is ruled by the despotic Argo family, led by ‘Commdor’ Asper Argo. Mallow lands on Korell and sits for a week before an unusually dramatic scene unfolds: a Foundation emissary appears outside his ship, demanding refuge. Mallow’s crew accedes, despite Mallow’s instructions, and to his extreme anger, as a mob appears outside demanding the emissary’s release. Mallow knows no Foundation emissary is even allowed on this planet, and so he has no legal grounds to protect him; Mallow perceives this a test by Commdor Argo. He releases the emissary to the mob and sure enough shortly receives an invitation from Commdor Argo. Mallow’s motive is to inspect the factories on this planet, to see if they really do have atomic power. He sees, by chance, a Korellian security guard in possession of an atomic weapon—with the symbol of the Empire on it. Then in an odd sequence of scenes, Mallow travels by himself inward into the Empire, and lands on the planet Siwenna, apparently at random, and meets a sad old man, Onum Barr, and via him manages to bribe himself inside one of the local atomic plants—which, he deduces, is kept running by technicians who don’t know how to repair anything that goes wrong. Mallow returns to Terminus, where he faces political charges over the abandonment of that emissary, and criticism for becoming wealthy due to private deals he made with the Korellians. Mallow claims the Foundation’s use of religion to control trade is outdated. Put on trial, he reveals evidence that the supposed emissary was a plant by the Korellian Secret Police, in collusion with a rival trader. Two years later, Mallow is now mayor, and explains his solution to the apparent “Seldon crisis” – do nothing. Let free trade have its way. The Foundation’s gadgets are more efficient that the lumbering Empire technologies; through lack of resources, the Foundation has been forced to become more efficient. Big and little. As noted above, the ending is rather anticlimactic. And this story more than the earlier ones is unevenly paced – though still eminently stageable as a series of set-pieces. The theme or lesson boils down to free trade and efficient technologies, and how former adversaries can come to rely on another – through non-zero sum games of free trade. History since Asimov wrote these stories has vindicated this theme – c.f. the US, Germany, and Japan. On the other hand, primitive religions have not disappeared; they’ve managed to acquire advanced technology anyway, and use it (as Gibson said, about the street finding its own use for technology) against the very societies that produced that technology. The idea of psychohistory is perhaps deliberately contrasting to the so-called ‘great man’ theory of history, that historical trends are determined by the actions of rare, exceptional individuals. There’s an analogy to the history of science here, where crucial discoveries are attributed to individual brilliant scientists — yet, wouldn’t those discoveries have been made anyway, by someone else? Psychohistory’s emphasis on ‘mob psychology’ to make predictions hasn’t worked out. On the contrary, understanding of basic human psychology – all those mental biases and the evolutionary reasons they exist – has become an analogous kind of understanding of that psychology, but on an *individual* level. These biases can be understood and possibly overcome through awareness education. But likely not in large populations. Primitive religions and their tribal motivations will always exist among the uneducated and unworldly. How will the second empire be stronger than the first? Why won’t it be subject to the same forces that eroded the first empire? This entry was posted in Isaac Asimov, science fiction. Bookmark the permalink.